Middle school students spend a great deal interacting with one another in the classroom. 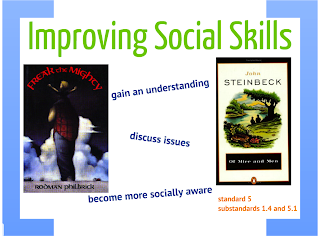 In order to help students learn more about different social situations teachers may choose to present their students with novels that discuss these issues. Such novels include: Of Mice and Men, Freak the Mighty, Gimp, Icy Sparks, and The Glass Castle. All of these novels reveal specific issues, mental disabilities, or social situations that students may not be entirely familiar with. Instructors may choose to discuss these issues with their students in order to help them gain an understanding of various social issues. This would be beneficial in the classroom because it would provide students with the opportunity to become more familiar with the struggles experienced by some of their peers or other people they encounter in their lives. The hope is that in learning more about these topics students will be more socially aware of how to treat one another. This would create a positive and happy environment in which all students feel welcomed. Reading and analyzing these novels will also give students a chance to apply what they learn to their daily lives.